The Royal Institute of British Architects have nominated Greece’s Stavros Niarchos Foundation Cultural Centre (SNFCC) in Athens for the prestigious RIBA International Prize. The biennial prize is awarded to a building which exemplifies design excellence, architectural ambition and delivers meaningful social impact. 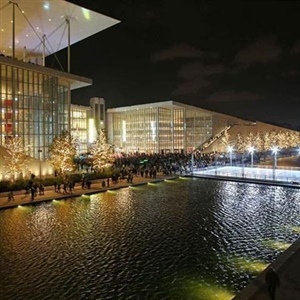 The Stavros Niarchos Foundation Cultural Centre is nominated along with the world’s best new buildings and is the only Greek nominee among 62 buildings in 30 countries. The Foundation was designed by Renzo Piano Building Workshop in collaboration with the Greek architectural office BETAPLAN, the SNFCC is one of Greece’s largest infrastructure projects that houses the Greek National Opera, a two-million-book National Library and the 170,000m2 Stavros Niarchos Park on the Faliro Bay shoreline. Winners of the RIBA prize will be announced in December 2018.